Serve with your favorite sauce for a delicious and simple dinner. We made a side salad and fruit. Yum! Mix the ricotta, spinach, egg yolks, grated cheese, nutmeg, salt and pepper together in a medium bowl until well combined. Stir in 1/2 cup flour until a sticky dough forms. Put the remaining 1 cup of flour on a plate. Take a large spoonful of dough, and roll in the the plate of flour, gently forming a smooth ball. Shake off excess flour. Form about 24 balls, and refrigerate about 15 minutes. Boil a pot of slightly salted water. Lower gnudi into water gently with a slotted spoon in batches of 6-8, depending on the size of your pot (keep water at a simmering boil so the balls do not burst). Cook until they float to the surface, about 4 minutes. Remove, drain well, and serve with your favorite warmed tomato sauce. Gnudi are very soft, and perfect for babies. These are not seasoned heavily, and could be tried on very early eaters. For younger infants puree one in a mini food processor or smash with the back of a fork. 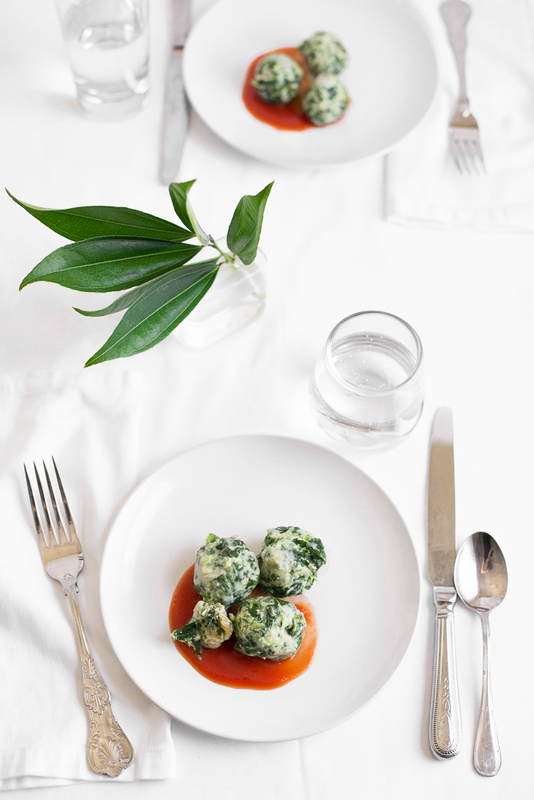 For older finger food-eaters, cut one gnudi into small bite-sized pieces. This is a great way to get some healthy greens into babies. Most babies can be safely introduced to eggs before one year, but talk to your pediatrician if you have a concern about food allergies, particularly if there is a family history.